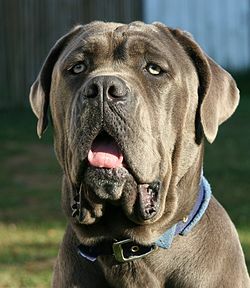 The Neapolitan Mastiff or Italian Mastiff, (Italian: Mastino Napoletano) is a large, ancient dog breed. This large breed is often used as a guard dog and family protector. Despite their looks, they are a big gentle dog with family and friends. They can be trained as guard dogs to protect people or property. Neapolitan Mastiffs need a lot of daily exercise. They are directly descended from the Tibetan Mastiff, one of the oldest dog breeds. According to American Kennel Club (AKC) standards, male Neapolitan Mastiffs should measure 26–31 inches (66–79 cm) at the withers. They should weigh 130–155 pounds (60-70 kg). Females should measure 24–29 inches (61–74 cm). They should weigh 110–130 pounds (50–60 kg). Body length should be 10–15% greater than height. Wikimedia Commons has media related to Neapolitan Mastiff. ↑ "American Kennel Club Neapolitan Mastiff Breed Standards". Akc.org. Retrieved 20 February 2015. This page was last changed on 23 February 2016, at 15:20.